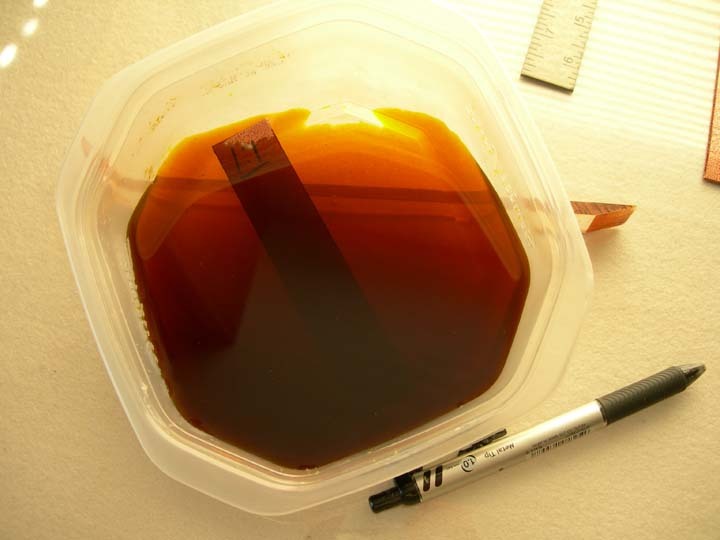 Ferric Chloride - how diluting it with water affects the way it etches copper. 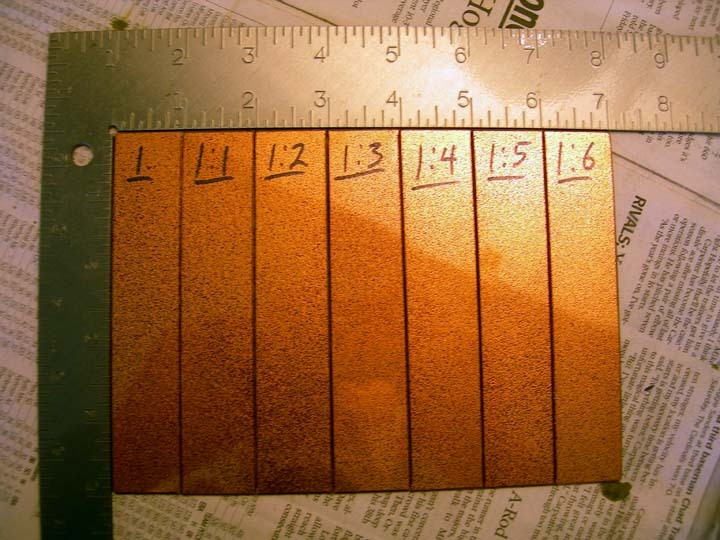 Recently I decided to do some experiments to see how ferric chloride at different dilutions will etch copper. I used as a "full strength" solution the solution suggested on the can of Iron Perchloride crystals (purchased from Graphic Chemical - I assume they're all pretty much the same) which was one pound of crystals dissolved in one pint (two cups) of water to make an approximate 40° Baume solution. I also tried 6 other dilutions which were one part of the full strength solution diluted with 1, 2, 3, 4, 5, and 6 parts of water, for 7 dilutions in all. Test Jar, empty. Test Jar, in use. Thin copper wire. One weight is a scrap piece of zinc, which falls into the sink and makes a loud clatter. The other weight is a white glass knob. 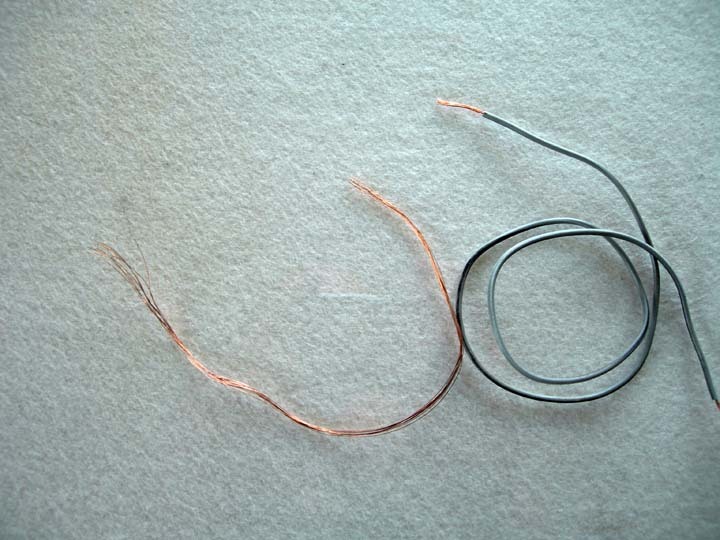 The copper wire is a single strand from a piece of 22 AWG speaker wire made from 17 twisted strands per conductor. These are the 7 test plates, aquatinted. 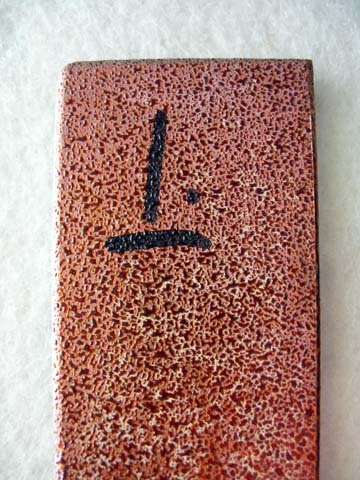 This is a test-plate in the ferric chloride. To run the etch tests, I dissolved a 1-pound can of Iron Perchloride crystals in two cups (one pint) of water. I let it sit overnight to cool off, and also a gallon plastic jug of water so both were at room temperature (80° F) (summer's here) by the next day. Then I put a cup of test solution in the jar and a cup of test solution in the small tray. 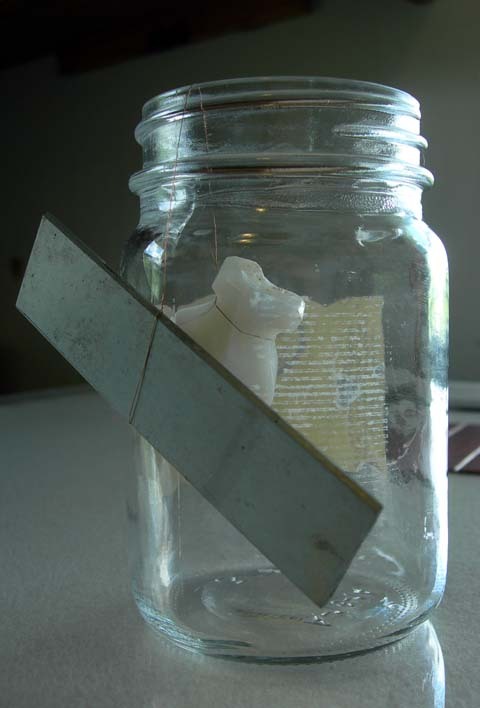 Then I placed one end of the wire (the white glass weight) into the solution in the jar and started a stop-watch. Then I placed a test plate in the solution in the tray and started a kitchen timer counting down, which was set for 15 minutes. When the scrap of zinc clattered into the sink, I stopped the stop-watch and noted down the time elapsed. When the kitchen timer started beeping I took the test plate out of the tray, rinsed and dried it and set it aside. Then I put all the solution back into a gallon plastic jug and added two cups of water, mixed, and poured out two cups of the new dilution. (I chose to ignore the fact that when you add the crystals to the water, you get about 2 2/3 cups of solution, not two cups, to avoid complication.) Since adding water to the ferric chloride solution caused a heat reaction which warmed it significantly, I put the two cups of test solution into a freezer long enough to cool it down to 80° F. before continuing with testing. I repeated this cycle until I had tested all 7 of the solutions. To check the accuracy of the "wire" test (not as part of this experiment) I repeated it 6 times when checking an old batch of 1:1 ferric chloride, which is the dilution I etch with, and compared the readings. I refreshed the test sample of solution for each test, and tried to do everything as uniformly as possible. The readings, in order of occurrence were: (1.) 7 min. 23 sec. (2.) 7 min. 4 sec. (3.) 7 min. 1 sec. (4.) 6 min. 37 sec. (5.) 6 min. 36 sec. (6.) 7 min. 47 sec. Not very accurate, but accurate enough. I suppose the main alternative to this would be taking readings with a hydrometer. I don't own a hydrometer, but I assume a series of similar repeated tests would yield very accurate and consistent results. 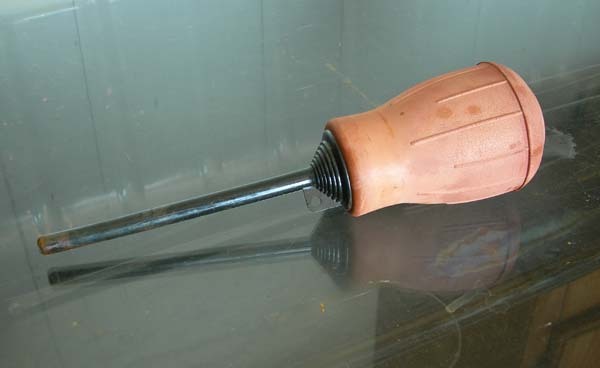 The question I have about hydrometers is not about accuracy, but about relevance. A hydrometer accurately measures one very specific thing; that is the weight of whatever you're testing compared to the weight of an equal volume of water at 60°F. When you're mixing a fresh batch of ferric chloride, that reading is probably both accurate and relevant. Of course with a fresh batch of ferric chloride you probably already know what you've got before testing it with a hydrometer. Throughout the life of that batch of ferric chloride as it gets used it becomes less and less ferric chloride, and more and more a completely different chemical mixture. I have never seen charts or graphs showing how the specific gravity of fresh ferric chloride compares to that of completely spent ferric chloride, which is no longer even ferric chloride. They would have to be complex, and I wouldn't want to have to rely on them. (Does the specific gravity change as it gets used? If so does it go up or down? Is it a linear or skewed progression? How does it change in response to use? Age? Dilution? Temperature?) 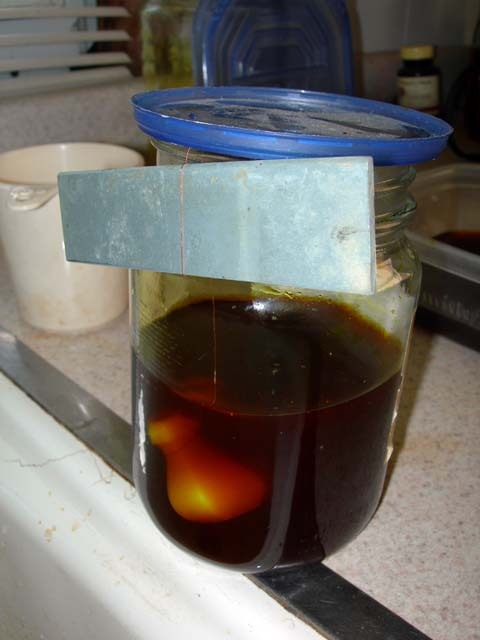 So as your batch of ferric chloride gets older and information about how it's going to etch your plate becomes more and more critical, your hydrometer is increasingly giving you information about something that may or may not have anything to do with anything. Not to mention other issues like whether or not some unknown party has contaminated the bath. The wire test may only give you "ballpark" information, but at least it's useful and valid. 1:1 (1 pint full strength, 1 pint added water) 7 min. 44 sec. 1:2 (1 pint full strength, 2 pints added water) 8 min. 46 sec. 1:3 10 min. 22 sec. 1:4 13 min. 44 sec. 1:5 16 min. 53 sec. 1:6 18 min. 26 sec. White deposits formed when etching with full strength solution. 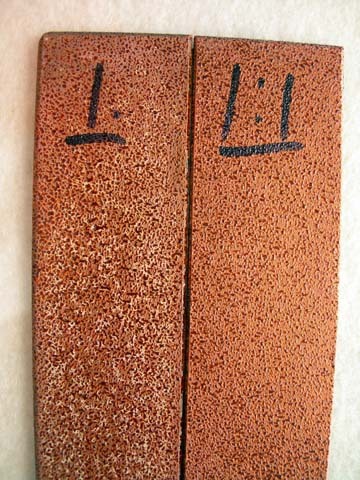 White deposits compared to normal etch when solution is diluted 1:1. I didn't try etching a plate upside-down in the strong solution to see if there were less white deposits than when etching it face-up (all plates were etched face-up only), but I suspect that it wouldn't make much difference in the etching action because the wire showed the same dramatic difference in etching times between the full strength solution and the diluted solutions as the plates did, though I never noticed any white deposits on the wire. If it was a gravity-related issue of something accumulating on the plate when face-up and blocking the etchant, it seems the wire should have etched dramatically faster than the plate in the full strength solution. I've also never used a vertical tank (or etched a plate face-down), so if using one or positioning a plate face-down fixes the problem then it would appear to be gravity-related. I've always gotten clean etches using diluted ferric chloride and a face-up plate, so I've never worried about it. This is the print made from the test plates. (flipped) There are 7 plates, hand aquatinted approximately equally, and each one etched face-up in one of the 7 test dilutions of ferric chloride for 15 minutes. The first one (1.) is from the 40° Baume solution, and is significantly lighter. The other six don't show any significant difference. (Slight differences might have been visible if I had used a box aquatint in stead of a hand aquatint.) It wouldn't be a bad idea to use a weak (1:6 or more) solution for etching fine aquatints to avoid dark areas from blobs of ferric chloride or dark edges where ferric chloride pools while draining off of the plate when removed from the tray. Check out my book about "Etching with Permeable Grounds"